The following appeared in HME News, the publication for the home medical industry, on July 26, 2011. This year and last, I asked the residents of Addison Court, the low-income apartment for disabled and elderly in State College where I live, to attend a demonstration at the Immersive Construction Lab, described here. 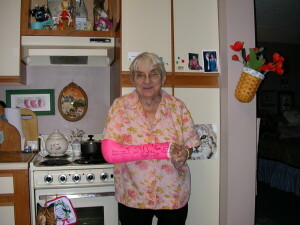 One of the participants was Lilian Hutchison, who celebrated her 87th birthday in January. No one can say for sure whether Lilian would have fallen several times in her apartment if this kind of technology were in place. However, the hope is that the future will be kinder to those of us who can benefit from design which residents are able to modify in advance. 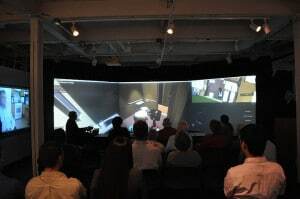 The projectors behind the three, 8-foot screens show a virtual reality world that can improve the environment where home medical equipment HME is used. Professor John I. Messner’s Immersive Construction (ICon) Laboratory at Penn States Architectural Engineering Department is a dark, windowless room where the healthcare facilities being viewed seem so real there is a special world for it: immersion. When Kaiser-Permanente began constructing a medical building in downtown Washington, D.C., pharmacists traveled 140 miles to State College to see how their workplace would appear. Among their suggestions: a partition so when two patients are served simultaneously, their privacy is insured. There is substantial growth in constructing healthcare facilities from hospitals to housing for the elderly. Previously, a model of how a building would look required physical materials like wood and nails. By comparison, virtual reality offers interactive models early in the design process. The resulting efficiency and cost savings (making changes to a building before it is built) are creating a boom in the use of virtual reality in the architectural, engineering and construction (AEC) industry. Expectations exceed the ability of the AEC industry to have virtual reality applications ready as quickly as desired. Sonali Kumar, a graduate research assistant at Penn State, is developing a 3-D model for an independent living facility for elderly and disabled individuals based on the concept of experience-based design. Experience-based design often refers to a body of academic literature, primarily health-care related. Designers are urged to consider the perspective of the individuals who build, maintain, work and reside in the facility, including patients and residents. A common example is the decision of a Philadelphia hospital to build its bathrooms closer to patients beds. Sonali’s model is based on a Blue Roof Technologies cottage in McKeesport, Pa. Pennsylvania has a larger number of elderly people in its population than any other state except Florida. The need for elderly housing is acute. In McKeesport, where the factory for steel pipes closed down leaving a near-ghost town and an elderly population of more than 20%, Robert Walters, a retired Penn State professor, created Blueroof. The cottages are constructed of pre-fabricated housing and have special sensors inserted in the walls to remind residents when to take their medicine (the walls talk) and to call 911 if a resident falls and does not get up in a timely fashion. Sonali’s model of a Blue Roof cottage makes use of interaction, the most significant new development in virtual reality. Look at the screen shot Sonali took of the power chair inside the kitchen of her model cottage. For those readers who have not spent their productive hours playing video games, an avatar is a virtual reality representation of an actor functioning in a 3-D environment. The avatar in the Sonali’s kitchen is a power chair. The power chair makes coffee and toast, opening the refrigerator door to get eggs and milk, and scrambles eggs on a stove the avatar has just turned on. Interactivity is key to understanding how practical people in the construction industry have come to use 3-D technology for practical purposes. Interactivity is arrived at slowly as Sonali experiments with a wide range of software. I suggested that Sonali replace the 3-D power chair with a scooter. In my experience, a scooter is more mobile and less likely to damage walls and take bathroom doors off their hinges. I ask a manufacturer to provide a 3-D scooter file, but for reasons I cannot explain (because I do not understand), the file does not yet open. Sonali explains, “We are in the process of integrating the computer model obtained from Amigo Mobility.” Keep your 3-D glasses on and await future developments. Joel Solkoff writes about disability issues from a customer perspective. He is an adjunct research assistant at the Department of Architectural Engineering at The Pennsylvania State University. Memorial Note: November 13, 2011, Jack Seidner aged 93, my neighbor and friend at Addison Court, State College. PA, died while talking to his son who had called from Israel. He died at Centre Crest, an assistive care facility in Bellefonte, PA, 11 miles from Addison Court. Jack was a veteran of World War II and was a monthly calendar boy on the Jewish War Veterans calendar last year He will be buried beside his wife in Harrisburg at a private funeral. I live in an independent housing apartment building in downtown State College, Pa. The nearly 100 residents of Addison Court are disabled or elderly. Most of us are poor–the more affluent are on Social Security or Social Security Disability and Medicare. Last year, Pennsylvania’s Department of Aging estimated it costs Medicare $40,000 extra each year for a resident to move from an independent living to an assistive living facility. The loss of dignity to the individual is incalculable. The French philosopher Jean Paul Sartre observed that when one tries especially hard to listen, often the trying gets in the way of hearing. Medicare is trying too hard to do the wrong thing. Medicare‘s purpose is not to save money, but to provide health care in a way that concentrates on improving the quality of life. Recent evidence on the brain’s adaptive capacity provides hope that not only can individuals resume physical capacity from the devastation of a variety of afflictions that affect us at Addison Court, but also we can regain our talents to improve this society, not simply take from it. “The Brain that Changes Itself, Stories of Personal Triumph from the Frontiers of Brain Science,” by Columbia University’s Norman Doidge, M.D., points to the brain’s ability to recover from strokes and other disorders with rehabilitation and concern. The Obama administration’s penny-wise-and-pound-foolish cutbacks on availability to durable medical equipment, rehabilitation services, and home health care are forcing residents of independent living facilities into the Centre Crests of this country. For example, the narrow focus is apparent in Medicare‘s frequent citations of the Congressional Budget Office’s competitive bidding estimates of relatively insignificant savings for Medicare Part B ignoring the astronomical costs that will result to Part A when disabled individuals like me can no longer pick up the phone and call my local medical equipment provider. Instead, I must wait for a competitive bidding winner (several have unsavory reputations and some are based out-of-state) to provide a battery. Delays could easily force me into Centre Crest as a result of falls, problems getting to the bathroom, etc. Delays would rob me of the ability to work as an adviser on virtual reality models for construction of future aging in place housing–construction which will result in significant Medicare savings. “Individuals with disabilities remain one of our nation’s greatest untapped resources,” said Rep Jim Langevin, D-R.I., the only quadriplegic in Congress. To release the untapped resources of the elderly and disabled, Medicare must stop thinking about saving money and start thinking about improving health. The money saved as a consequence of concentrating on what is right will astonish the body politic. Providers of durable medical equipment require the support of consumers like me. Providers and rehabilitation therapists have been slow to recognize that in unity there is strength. Together they must spread the word that when an individual becomes old or disabled, science is rapidly increasing the ability to regain talent and good health. Joel Solkoff is the author of “Learning to Live Again, My Triumph over Cancer” and is adjunct research assistant at Penn State’s Department of Architectural Engineering. A shot from the revolver of the Rhode Island policeman went off by mistake. The bullet hit Jim Langevin, a 16-year-old boy, who was a police cadet in a Boy Scout Explorer Program. It hit Langevin’s spine and kept going. The damage made him a quadriplegic (paralysis of both arms and both legs). Rep. Langevin is the first quadriplegic to serve in the U.S. House of Representatives. To enter the House chamber 10 years ago, when he was first elected, the maintenance crew made the chamber wheelchair accessible and removed two fixed seats in the front row so Langevin could maneuver his power chair and effectively address his fellow colleagues. Langevin has made his reputation in Congress as an expert in terrorism, computer security, and biological warfare. This column comes to you at an awkward time. This column will appear in early December, before the seasonal gloom causes you to cheer up others with presents. This December/January issue of Voices stays on the stands until Jan. 31, by which time you will have already broken the New Year’s resolutions you have not made yet. More to the point, for those of us who care more about politics than football, December marks the end of the lame duck Congress, controlled in the House by the Democrats and is succeeded in January by a new 112th Congress with a large majority of Republicans (63) new members) and not enough Democrats in the Senate to break a filibuster, but enough to sustain a presidential veto. In short, the next two years promises to be a period when NOTHING will get done. Since Congress controls spending, it is possible that legislation that was dear to the president’s heart will find itself without the money to implement. For those of you so inclined, Gloom is a gift that will not go out of style, especially between now, February first, and beyond. This column focuses on the problems and opportunities of the elderly and disabled here in Centre County. I chose to interview and profile Langevin because of a letter he signed at the end of the summer, just as the vacuous senate race in Pennsylvania was beginning to heat up. The other signer was Glenn Thompson who represents us here in State College. Langevin is a liberal Democratic; Thompson a conservative Republican. Langevin voted for Obama’s health care reform bill; Thompson voted against it. Why are these two unlikely representatives working for the same cause? The cause is the fight to keep local medical suppliers in business. This is a cause that affects me personally because without a battery-operated wheelchair I would not be able to go from my bed to the bathroom, or to the kitchen to make dinner, or outside to work and make a life for myself. Previous attempts to reduce costs by giving large corporations, some outside the Commonwealth, contracts to provide wheel chairs, scooters, power chairs and oxygen, have resulted in companies with unsavory reputations receiving the lowest bid and raising the likelihood that poor and middle class individuals who are unable to walk face long waits for equipment delivery, maintenance and repairs. The consequence of these waits are likely to be accidents of the kind that would force independent people with disabilities to move to assistive living resulting in cost increases many times greater than Obama’s penny pitching savings on medical equipment. Langevin and Thompson agree to end competitive bidding and (the subject of the end-of-summer letter) to halt Medicare’s requirement that customers be given the option of renting their chairs for a 13 months, rather than buying them—through Medicare–in the first month. Power chairs are custom designed to the needs of individual patients, and forcing medical suppliers to pay for them in advance will badly damage a business that is already strapped for cash. Langevin’s exclusive written interview of over 1,700 words is available on my blog at voicesweb.org. Thompson and Sen. Robert Casey, Jr. have expressed the desire to give you their points of view. Stay tuned. –Joel Solkoff, author of The Politics of Food. Contact him at [email protected] or at voicesweb.org.